In a bowl, mix all the ingredients and let it marinate for 10 minutes. 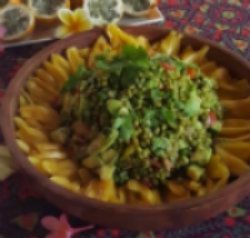 Garnish with seasonal fruits, coriander leaves and avocado. I used jackfruit in the photo above as it was on our Bali Retreat. Soak 1 cup mug beans overnight. Rinse and drain well then leave in a colander covered with a light moist cloth. It will sprout a small white tail by evening in tropical places like Singapore but here in Chicago can take upto 2 days in the winter. Keep the cloth moist! Store sprouts in an airtight jar in the fridge. Will last for 1 week. * Note: Mung doubles in size when sprouted. 1 cup mung will yield 2 cups of mung sprouts.